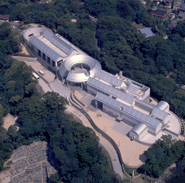 The Hiroshima City Museum of Contemporary Art was opened in 1989 as the first public museum in Japan specializing in contemporary art. Commemorating the facility’s 30th anniversary, this exhibition focuses primarily on the trajectory of the museum’s activities and the architecture that has served as a foundation for them. Drawing on the collection, which has been amassed over the years, and documents related to the museum’s various programs along with some new works by participating artists and other materials, the exhibition will unfold throughout the entire facility. Based on a series of keywords such as viewer, architecture, place, conservation, history, deviation, and in-between, the exhibition looks back at these aspects and sets out to reexamine the museum’s appropriate role and various factors that support its activities. Needless to say, the museum could not survive without visitors. In this section, adorning the beginning of the exhibition, we present a group of works that are realized through visitors’ influence and participation, seemingly exemplifying the special features of the museum as a place. 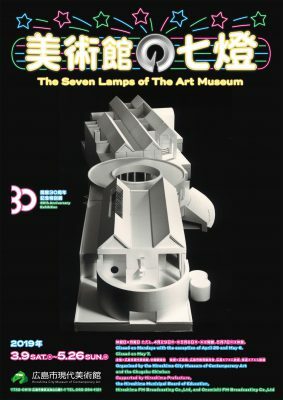 The Hiroshima City Museum of Contemporary Art is in itself a work of architecture designed by Kisho Kurokawa, and the sculpture on permanent display combines with various design elements within the building to create a place for storing and viewing art. In this section, we examine the facility’s architectural appeal while showcasing the design of the furniture and sign system, and the sculptural works that are integrated into the architecture. The museum is inseparably linked to the place where it was built. Moreover, in order to emphasize the fact that Hiroshima is an atomic-bombed city, its name is often written in the katakana syllabary (in English, we have used all caps to convey the same meaning). At the museum, both Hiroshima and HIROSHIMA are important themes in our work. One of the museum’s most important functions is to collect and preserve artworks and documents. To achieve this, one of our primary tasks is to save works of contemporary art, which often make use of non-traditional materials and methods, and which are based on completely different concepts. While striving for continuity and accumulating data, the museum considers different approaches and directions according to each project. By combining related works and documents charting the museum’s course from the preparatory stage to the present, the locally-based design unit Mata Mata will oversee the art direction for this retrospective. Relying both on history and context, and imaginative leaps, the artist Yuichiro Tamura examines the background of places and things as he spins a fanciful story composed of various elements. 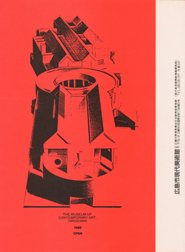 These efforts will come to fruition in an installation work based on Tamura’s research of the museum’s architecture and the era in which the facility opened, and his own bold associations. In events such as the Open Call for Art Project Ideas, in which the public is invited to submit new practical plans for places in the museum that are not used for normal exhibitions, many artists have created displays by reinterpreting spaces in a creative manner. Perhaps these efforts indicate that certain expressions that cannot be conveyed using the traditional museum framework.